There's more to pocket handgun carry than just stuffing the handgun in your pocket. You have to be able to get the gun in hand in a reasonable amount of time without fumbles, yet it needs to ride in your pocket such that it won't stick out (or fall out) of your pocket while going about your normal daily activities. Of course, the gun should be concealed so it goes unnoticed by casual inspection. If the pocket-carried gun is your primary or only handgun, being able to get a good grip on it while in your pocket should be your starting point. With a firm grip, whatever prompted you to start to draw, you are more likely to still have the gun in hand. You don't want to be teasing the gun out with a few fingers, completing the draw as the gun clears your pocketâ€”somewhat like shuffling cards in a card game. After some practice, the entire grip, draw and directing of the gun should be reflexive. By and large, a holster is necessary for pocket carry. And not just any holster nor just one holsterâ€”unless you only wear one type of pants, all of the same material, with the pocket the same size and opening, and which all fit you the same. In my experiences with pocket carry, I've found there is no single right holster or right gun. With traditional blue jeans, my S&W J-frame five-shot Centennial revolver is too large; the pant pocket pulls too tight to allow any sort of a decent grip on the gun, and the general tightness of them creates an unsightly bulge. My solution is to carry a small semiauto such as a Seecamp in a compatible holster. However, that came with its own set of problems. Carrying the Seecamp in cargo pants I quickly found both gun and holster too small for the large pockets. The combination rotated and shifted as I moved and I found myself digging, squirrel-like, to get a good grip on it. If I feel I need a bigger bore, I switch pants and guns or change my mode of carry. I also find I need a different holster and/or gun when wearing dress chinos or slacks. Most importantly, of course, your pocket holster should stay put. You don't want to draw your gun and find when you direct it at a threat, you're holding a holster-wrapped gun in your hand. The proper holster should retain the gun, and the pocket should retain the holster during your daily activities. Most of the modern pocket holsters have some sort of stiffening encircling the holster mouth, and the holster bodies are either molded to the gun or do mold to it after some use. One downside to the latter: I've had the holster, after much continued use, become molded rearward over the top rear of the handgun, which then made the gun stick to the holster, so I was in danger of drawing a holster-wrapped gun. Some pocket holsters, though, are made with an upward vertical projection that actually catches on the pocket. This works, particularly when coupled with the practice of dragging the holster's forward area against the pocket's interior when drawing the gun. This is just one more thing to forget to do, however. Along with all this, you should be able to reholster as smoothly as you withdrew the gun. Stuffing the gun back in and having it hang up on the mouth of the now-closed holster can allow the gun then fall back out. And yes, I've done this too, but fortuitously not until I had belted myself in my car. One last item is personal comfort. Some holsters are made with the leather rough-side out or with a rough finish to a composite surface so that the holster drags on the pocket. This works, but if the pocket material is thin, the constant rubbing of the holster's rough surface on your leg is irritating, and you might then develop the habit of "handling" the holstered gun to alleviate this, which can draw attention to the gun. Again, you need to make careful choices on guns, gear and dress. And you definitely need to try out whatever choice (or choices) you make at home before venturing forth into the real world. A final note. If you do not yet use pocket carry and decide at some point you're going to try it, you must take this rule to heart: Nothing else ever goes in the pocket with your handgun. Not once. Then you will never have any stuff keep your handgun from functioning or more important, preventing or hindering you from getting your gun when you need it. A holstered pocket gun always rides alone. 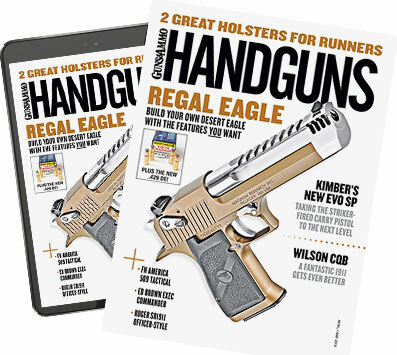 This article originally appeared in the December/January issue of Handguns magazine.